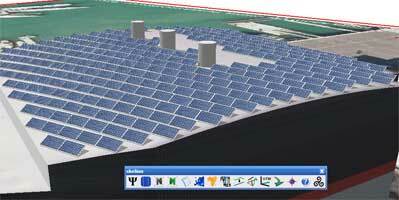 Skelion plugin gives Sketchup the possibility to insert solar panels very fast and make fast renewable solar energy studies. A new free and commercial version have been released. Skelion 5.1.9 (Oct. 2015). Shadows projection and one and two axis solar tracking. 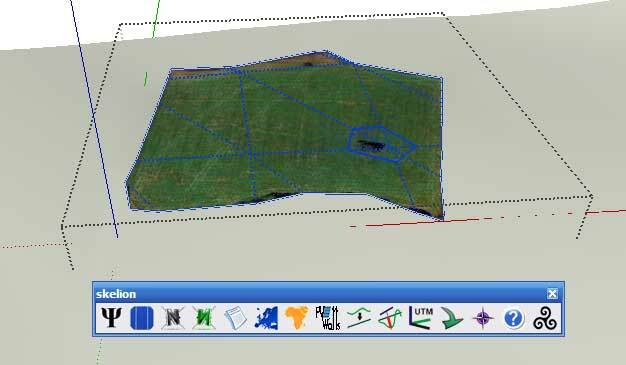 Adaptation of Ground mount system to a 3D mesh, all solar components with same orientation. Last edited by Juantxo on Mon Oct 19, 2015 4:34 pm, edited 30 times in total. how awesome... that's pretty handy. I am sure it 'll come in handy! Haven 't tested yet but judging from the video seems you did some fine work! A new version has been released with some bugs fixed and a commercial version with more features. At the office we use Trend Micro security software and for some reason it blocks the site. It seem to have been black listed. http://skelion.netne.net/ is a free hosting. May be it is the reason. In the future I'll change the hosting if I'll see interest in the plugin, but not now. Yea - it's a potential problem with shared hosting. I'll have to check it out when I get home. I can't get around Trend's blocking. Here is a zipped copy I downloaded from the site. Select "skelion.rbz" and accept to install it. So can anyone help me with the installation? Jim, RBZ is a new file format (with M2) and it is actually a renamed ZIP archive (RBZ = RuByZip). RBS is a scrambled RB ("RuBy") file and you need (and can) not do anything with it. Sorry jwood2012, you need to clear the cache of your browser to download current version. The problem is you downloaded an older version. which is the best guide to extracting and installing the contents of a .ZIP archive. The .RB/.RBS file-types within a .ZIP or the extracted folder[s] are equivalent in their operation - it's just that you can't 'read' a .RBS file as it's been 'compiled'. IF you are brave enough to rename a .ZIP file suffix to .RBZ file you can then install it that way too. 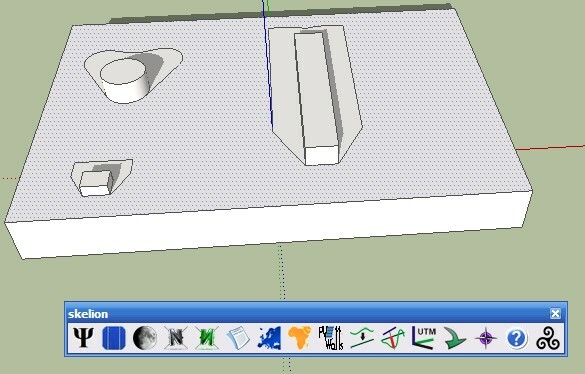 I really like this plugin for SketchUp, had I'd known about it from the very beginning it would have helped me produce models quicker and easier. 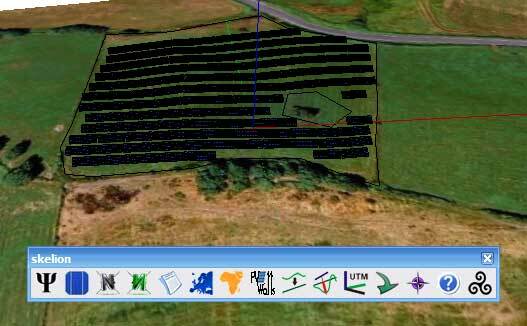 Anyway, my main question regarding the plugin is how do I get it to maximise the full area when laying down solar panels? For example, I put a 16" offset from the edge of a residential roof. After selecting the now smaller area and when I have plugged in the tilt/azimuth, etc., the panels don't take up all the space available. They seem to work from the middle > out. I had to move them to one side to add an additional 2 rows within the same space. Is this just in the free version or is it deliberately set up like this? Please, send the model or an image please. Plugin insert panels in rows, from down to the top, and centering panels of each row from borders. Actually not maximize space in vertical. User must sometimes modify rows. May be in a future it will be improved. I must have been entering something wrong as it seems to match it now on some of our previous models we've done. However, I did notice on the following attachment, that it doesn't seem to align itself along the roof edge and thus having an angled system from top left to bottom right. Judging by the measurements we can get two rows of panels aligned with the rooftop edge, but just wanted to throw this out to you. Thanks for your post. Some people have problems understanding how to insert panels. So I think it's necessary make a video to teach how to insert solar panels, co-planar or with some tilt, over the roof. Selecting an edge and a face, and using the rights azimuth and tilt relative you can insert the panels in many ways. Finally, last version of Skelion runs on MAC. Thanks to Dan Rathbun, driven and thomthom for their help in the task. Maybe with this video you will be able to understand better how plugin works inserting components. Last edited by Juantxo on Mon May 07, 2012 11:18 am, edited 2 times in total. Oddly, a friend asked me yesterday if I could draw up some solar panels on his house. however, I only get one grey button, with no functionality, and no errors in ruby console. As I can't see the script, I can't see what paths are expected. Sketchup installed [via the rbz] into my ~/Library/ path, not not the normal HD/Library path. does it have any dependencies? or require statements? It will be a path issue or maybe you downloaded an older version. I had some problems in the web with browsers cache. Today I changed the name of file so name is "skelion_v52.rbz" for no confusion. With normal users, and stored in normal path of a MAC, ir works. "Library/Application Support/Google Sketchup 8/Sketchup/plugins/"
@Juantxo: Avoid using Sketchup.find_support_file to determine the path for your plugin - it might not be in the default SketchUp folder at all. Some times OSX users place then in their User folder - and some users place their plugins in a shared folder elsewhere. Instead use the __FILE__ constant that returns the name and path of the current file. That makes the plugin robust to any location it might be installed to. driven wrote: Sketchup installed [via the rbz] into my ~/Library/ path, not not the normal HD/Library path. Now is fixed. Download "skelion_v503.rbz". I've tried the extension renaming trick, Sketchup still doesn't allow me to select the RBZ file. Any other way to get this done? masonc wrote: I've tried the extension renaming trick, Sketchup still doesn't allow me to select the RBZ file. Any other way to get this done? Simplifies installing .zip, .rbz, .rb, .rbs plugin files to your plugin directory. One of the features you should consider adding is a roof edge spacing, as in, I want to calculate the amount of PV on this roof, here is the panel, here is the tilt, I want to remain 18" from the edges as per best practices. It would make it easier to calculate the maximum PV given a certain roof shape. Ok, maybe in next release multiple offset could be added. A new version (skelion_v504) has been released. Now you can pile up components in same row and distribute rows in same grid with "rows alignment". A user's guide has been added too. Just purchased the Pro version but would be helpful to have a better tutorial... having lots of trouble figuring it out.